Sumac’s of the Rhus genus fit the bill perfectly and grow extremely fast. Two species are in contention and neither grows taller than 25 feet and are extremely drought resistant. Sumac’s spread via roots forming thick groves that can commonly be seen along side and in the medians of Virginia’s interstates. 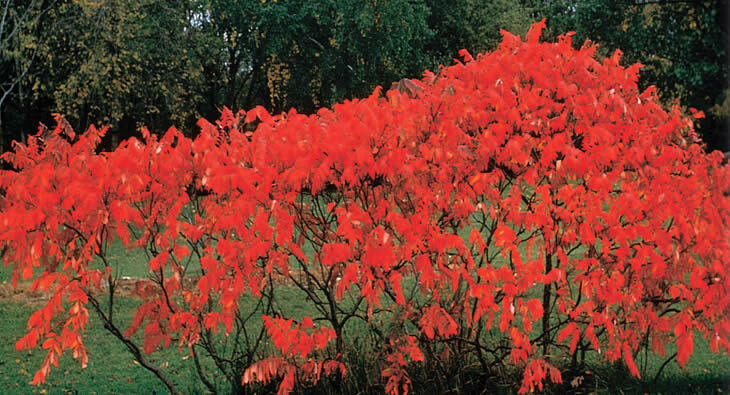 This rooting habit has given Rhus shrubs a weedy reputation for landscape gardeners when planted for its incredible red foliage in the fall. Yet it allows the gardener to rejuvenate the stand by mowing it down in the winter stimulating basal shoots that regrow an often thicker grove in the following spring. These shrubs/small trees like sunlight, but can tolerate some shade. Sumac honey is produced from May to August is is well regarded. Rhus typhina can grow up to 25 feet and forms hairy branches that resemble velvet antlers yielding the common name Staghorn Sumac. Canadian researchers observed that 72% of honeybees worked male flowers for pollen in the morning while 78% gathered nectar in the afternoon. These will be planted on the slope where no overhead power lines exists. The lines on the eastern half of the entrance road limit plantings to shrubs so Rhus glabra will be planted. Smooth Sumac rarely tops out above 15 feet so they will not disturb the power line. If any specimens pose a threat, it can be mowed and the roots will replace it with new shoots. And just to put any fears to rest, the related poison sumacs can only grow with wet feet meaning they are found in bogs, marshes and wetlands. Most people will never encounter poison sumac as their required habitat is inaccessible by most modes of transportation except a fan boat!